Commission a Mosaic Mural™ to increase your group's capacity to be more creative, collaborative, self-reflective, and solutions oriented. The process can also be used to help teams or groups unify around a vision or mission in order to cooperate, ideate and iterate more effectively in their daily work. The basic process is outlined below. For comprehensive examples of completed Mosaic Murals, see the Case Studies page. First, an outline of an overall image is created that exemplifies the mission, vision or gaol of the client. The master artwork then gets cut into "tiles" – the total number of tiles most often equals the number of participants. 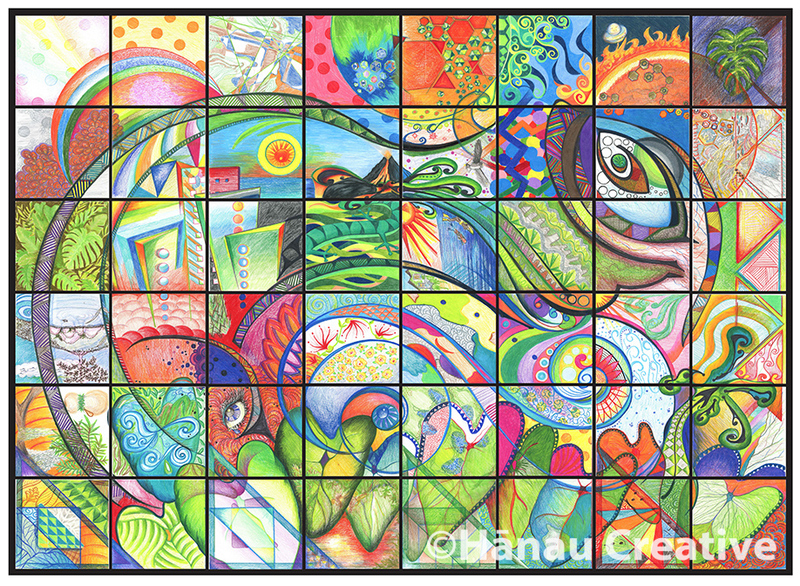 In parallel to customized activities, each person colors their individual piece or tile and then they are reassembled and merged into one cohesive mural. However, the magic of the process comes from people's individual desire to become part of something larger then themselves––to let go of their perceived limitations and even fears, and allow their creativity to emerge and be amplified. At the start of each workshop, participants introduce themselves and offer one thing they want to receive from the experience, and one thing they desire to contribute. They then choose a singular tile and begin coloring. Dialogue between people is an integral component of the personal and collective growth process. Nearing the end of the workshop, the floor is opened for people to offer their feelings and reflections. There can also be a facilitated dialogue around a particular topic or theme depending upon the purpose, deliverables and long terms goals of the overall project. The final artwork is created be adding an overlay of patterns and an intensification color. The completed artwork is then scanned, mounted and delivered. Each participant also receives a digital copy. The images above show before and after pictures of tiles from various Mosaic Murals™. Pricing for Mosaic Mural™ experiences vary and is based on overall size of the artwork, the number of people participating (and their general age), and whether or not customized pre and/or post activities are desired.